This is a yummy, quick soup, especially if you have left-over rice in the fridge which we often do. I got it from Ross Dobson’s market vegetarian and he mentions that these sorts of boiled rice soups are often eaten for breakfast in China and other Asian countries. I would love to try that sometime but find mornings are too busy to actually “cook” something. But it does kind of make sense – this soup is warming, comforting, filling, and nutritious. What else do you need to start the day? Or end it? Or mark the middle of it? I guess ultimately it’s the perfect breakfast, lunch, or dinner! Put the oils in a saucepan and set over high heat. Add the garlic and scallions and cook until the garlic is turning golden and just starting to burn. This will give the soup a lovely, nutty garlic flavour. Add the ginger, chile, and rice to the pan and stir-fry in the garlic-infused oil for 1 minute. Add the stock and soy sauce and bring to a boil. Cover with a lid and cook over low heat for 30 minutes, until the rice is soft and the soup has thickened. Add the greens and cook for 5 minutes, until they turn emerald green and are tender. 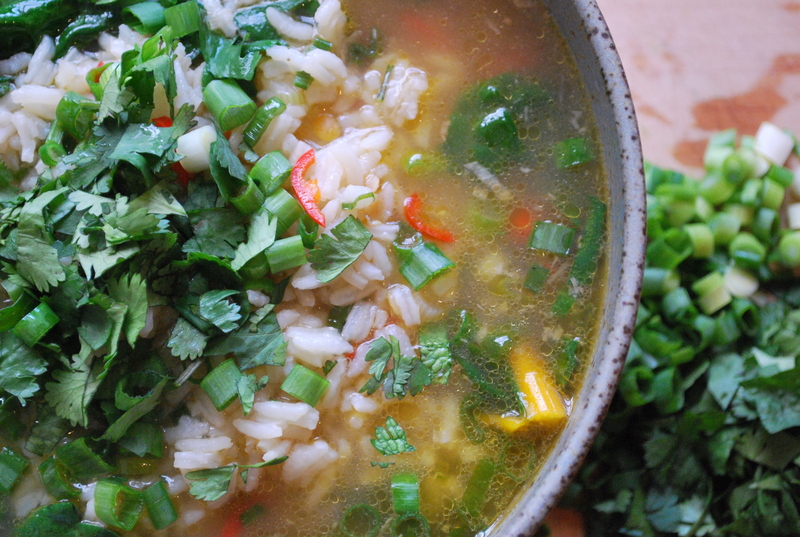 Ladle the soup into warmed serving bowls, sprinkle the cilantro over the top and season to taste with pepper. I’ve been flattened with a cold and fever for the last 2.5 days. Jonathan made a batch of this soup for me on Sunday night and it’s all I’ve wanted to eat ever since! He had to go out yesterday to get more ingredients to make another batch – LOVE this soup! It’s magic healing potion. I bet it would be good as a base for vegetarian Pho. I love that you love the blog and have found healing power in this soup. Obviously meant to be. Get well!! Feel better!! Drink tea!! Kiss Jonathan!! I would substitute Japanese miso soup for the vegetable stock and eat the soup with noodles, ( Japanese ramen style ) Great recipe!! Thanks for the comment and the fab idea. I love this and am going to try it – especially as we head into colder weather. This is such a great fall soup to warm you up and ward off any flu bugs. So glad you found it – thanks for building up the repertoire! This soup looks so perfect (maybe especially because I have a cold right now…). I might try making it with kale! Kale would be awesome. Currently my favourite green! I hope you like it and I hope it helps your cold. I know it’s done wonders for me and others. Thanks! By the way, I love your blog. So glad I stumbled across it yesterday. Oh and I made the soup tonight, substituting a green chili for the red, and added kale and yellow lentils. Delicious!